Pros: Unlike flowers which will eventually die and dry up (and can only be preserved for a certain amount of time) a brooch bouquet can last forever. You can walk down the aisle with family and friends who cannot be there for the big day (by using their brooches in the bouquet). You can make the bouquet at home (with the help of friends and family) and it can be a fun project for everyone. Cons: They are heavy! All that metal really adds up to some extra weight. 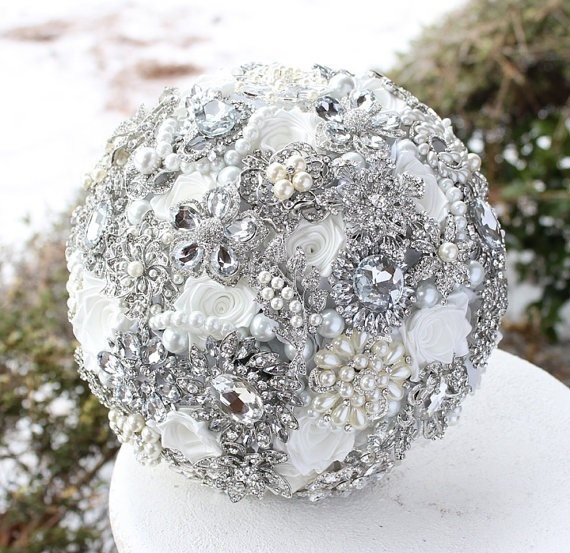 The big question -How do you go about making a brooch bouquet? The easiest way to start is to ask the women in your life for help. Ask your mom, your aunt, your grandmother, your mother in law and your friends to see if they have any brooches to contribute to the bouquet. It can be something small and inexpensive that they found at a store or it could be a family heirloom that has a lot of meaning and sentiment. Ask each person to write a little something about where the brooch is from (is it from an antique store down the road or from your great, great grandmother who bought it in Rome?) It will be nice to read the stories of how these brooches made their way into your life and it is a nice keepsake to have from the wedding. Pressed for time? That’s ok. You can order one of these beauties online! View our Pinterest page for more classic brooch ideas. **Brooch bouquet photo used from Etsy (AnnaSinclair) here are more of her beautiful creations. This entry was posted on Wednesday, April 2nd, 2014 at 6:50 pm	and is filed under Weddings. You can follow any responses to this entry through the RSS 2.0 feed. You can leave a response, or trackback from your own site.